Bracelets: the usual plus two beaded Sportsgirl Butterfly Foundation bracelets, Lovisa 'Collette by Collette Dinnigan' twisted bow charm bracelet in silver, Lovisa 'Collette by Collette Dinnigan' heart charm bracelet in silver and enamel coated Marc By Marc Jacobs Katie bracelet in pink. Went to the stores to try out some cameras and decide which one to buy. My old camera had something get into the lens a few weeks ago and it can't be cleaned out. As the zoom functionality broke a while ago too it was definitely time to upgrade. DH was very sweet and gave me an IOU for a camera for Christmas, knowing that I hadn't picked the perfect replacement yet. Together we picked the Sony NEX5R digital camera in store today. The SA Lisa in Camera House was so helpful! I'm really impressed with how much functionality the camera has for blogging and I'm excited to use it for future posts. The sunnies were last worn here, dress here, sandals here and bag here. Had a relaxing Sunday today, and had the chance to play around with my new camera to take today's outfit pictures. Have been learning where everything is and taking as many different pictures as possible to get a feel for all of the new settings. Have been following Cooper around all day trying to get different shots of him, haha! It's good he is such a patient little dog. The sunnies were last worn here, singlet here, shorts here, thongs here and bag here. Yeah both lovely outfits but I love the blue bag from first one!! Nice outfits and you have so cute dog. Have agreat end of the weekend. the first outfit is my favorite! the blue color is so refreshing :) anyway happy new year to you! Ow love your simple style somuch dear. You play in blue is preety..
love the first dress so much and I see your cute dog again! great outfit! the color of the bag is gorgeous! Those bags are gorgeous! Seriously want them both now! can't go wrong with that outfit for the weekend! Hurrah for the new camera, I really need to get myself a decent one! That's a gorgeous dress. Cooper is so cute. I love this dress, this is so unbelievably pretty! I love your dress! And your dog is so cute. Thanks for droppin' by in my blog. Hello dear Mica, and a Happy New Year to you! Thank you for stopping by to say hello, sweet friend! Awhhh your dog is precious! I love the bags, too cute! Jealous of your warm temps! Super cute dress! I've been wearing dresses a lot lately too, it's perfect for this heat. yay for a new camera! Gosh, where do you live that it's warm enough for that pretty dress?! I love the blue & black color blocking!! hehe I'm glad I'm not the only one using my dog as a test subject! I'm finding it so hard to get the right settings I want for outfit shots - lots of practice still needed, and maybe a tripod too! Very cute color coordinated outfit! Love your bags as always! Loved you shorts look! Really cute! Love both looks! And the dog is so cute! That dress is GORGEOUS Mica! First, I love the two color and that it's a hig/lo dress. Looks awesome on you my friend! Awesome camera! Another blog buddy of mine uses it and she's always getting compliments. I can't wait to see your photos using it. You're going to love it! thanks Kim! It's a lot more difficult to get the perfect photos than I thought with it, I need to practice more! 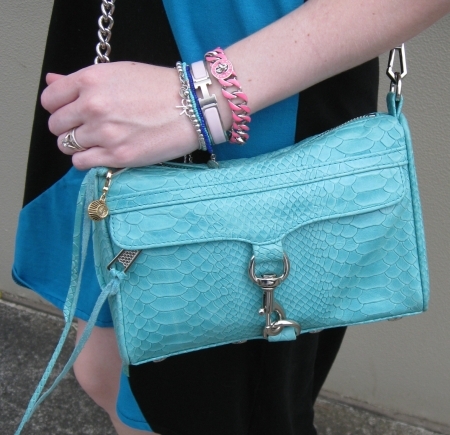 Loving your Rebecca Minkoff bag, such a pretty color! Love the dress & the bag from the first outfit! dresses are gorgeous and other acessories are amazing m loving it.......!